Though he only has two films on his resume, it's safe to say that no one makes movies like Wes Anderson. Despite barely being released in theaters, his debut, 1996's Bottle Rocket, still found an audience on video. Starring brothers Luke and Owen Wilson (who also serves as Anderson's writing partner), the sweet, complex, humane comedy about a hapless group of aspiring criminals struck a chord with most who saw it, even while languishing in relative obscurity. Rushmore, Anderson's follow-up, doesn't seem likely to meet the same fate: It has a high-profile star in Bill Murray and the support of its studio. More importantly, the film has gathered an avalanche of good will from critics, many of whom began publicizing its virtues in November, long before most people could see it. Rushmore tells the story of a lovestruck 15-year-old private-school student whose desire to achieve in every extracurricular activity is outstripped only by his inability (or unwillingness) to recognize his limitations. Raised in Texas, the 33-year-old Anderson shares with his film's protagonist a private-school background (Rushmore was filmed at the academy he attended as a boy) and prodigious creative instincts (like Rushmore's hero, he channeled much of his energy into staging elaborate school plays). Anderson recently spoke to The Onion while touring America in a yellow school bus emblazoned with the Rushmore logo. The Onion: Tell me about this bus tour you're on. Have you had any strange experiences on it? Wes Anderson: We've been from L.A. to Phoenix, to St. Louis, to Washington, D.C. We haven't had too many strange experiences, but you do have to adjust to being on the road all the time. But there have been some fun stops. D.C. was great and New York was great and Chicago was good, too. Boston should've been fun, but we didn't have any time there. O: One thing I've noticed about your films is that people feel very strongly about them. A friend of a friend of mine uses Bottle Rocket as a sort of litmus test for whether or not someone is worth talking to. And I've rarely seen a film generate as much advance critical good will as Rushmore. Do you ever get the feeling that you're giving people something they didn't know they wanted? WA: Yeah, because I certainly don't think it's something that people expect. I don't know that they're imagining what it's going to be like and there it is; it's like what they thought. I think it's different from what they would have thought. With Bottle Rocket, it's funny, because the movie… Not that many people saw the movie when it came out in theaters. O: It didn't play that many theaters. WA: No, it didn't. They really didn't take it very far. But now, going on this tour, there are all these people who show up, who are big Bottle Rocket fans. This one kid came over yesterday in Chicago, and he wanted me to sign his birth certificate. WA: Apparently. So I signed it. I wrote, "This is to certify the birth of"—I think his name was Nick—"by the power vested in me." O: I don't know that that carries much legal weight. WA: No. I don't know if this guy confused me with some other guy. But I'll sign it. O: When you first started out, you had Texas as your base, and still do. Did you find that that worked against you, or is there enough of a film community in Texas now that it wasn't a problem? WA: It doesn't really matter much where you make your movies. It's who you know in Los Angeles. That's an important thing. Who is going to get you the money? Who is going to get it released? But where you work, I don't know if that really has too much to do with it. Texas is a good place to make movies. There are lots of people who are interested in them, and you can get together the right team. O: What's your writing process with Owen Wilson like? WA: We do a lot of talking about what we're going to write for a long time before we ever start to write. And when we do start writing, it's a lot of trading scraps of paper back and forth for a long time. That sort of grows into something. WA: No. He's in some photographs that are on the wall in one of the rooms, but he's not physically in the movie. But both of his brothers are in it. O: What's your approach to integrating songs into your films? They play a key role in both Bottle Rocket and Rushmore. WA: The songs are always a part of… That's just always key stuff for me. Some of the ideas are kind of inspired by the songs, and I always want to use music to tell the story and give the movie a certain kind of mood. That's always essential to me. O: Do you ever hear a song and think, "I have to have that in a movie?" O: What's an example of that, a case where a song actually made it in? WA: Every single song that's in Rushmore. WA: Yeah. They're all songs where… With Rushmore, I originally had songs I said I wanted to use in the movie, and then I did research in this certain area of music, British Invasion music. I would just listen to songs and I'd know what should go in there. Like the song by Unit 4 + 2 called "Concrete And Clay," or this song by Chad & Jeremy called "A Summer Song," and a song by Creation called "Making Time." And there are some songs by The Kinks that are in there. There's a song by the Stones called "I Am Waiting," which I was listening to a lot when I was driving around, and suddenly I realized a certain part of the story… That whole part of the story evolved out of the feeling that that song has. It's like it was right for a certain part of the story. O: One thing a lot of people don't seem to be talking about with Rushmore, which I thought was really close to the surface, was the class issues. Max (Jason Schwartzman) is not from the same privileged background as his schoolmates, and that's what draws him to Blume (Bill Murray). WA: I think the class issues are all over it. But I don't know that I have too much to say about it. I'm not trying to make some major social statement. It just has to do with my own personal feelings and observations of things. O: It kind of puzzled me that a lot of people weren't commenting on it, though. Can you think of why that is? WA: I don't know. It's not something we particularly strive to hit on the head, but I think it's just sort of basic to the material. I don't know why people don't comment on it. It's nothing that I get that excited about talking about, even, because I feel the stuff that I have to say about that… Those questions are sort of political. I feel like my thoughts on it are better expressed by the stories, because they're cliched ideas. But you might have ideas that are cliched which make sense in a dramatic story, but when you just talk about it, it's like, "Big deal." 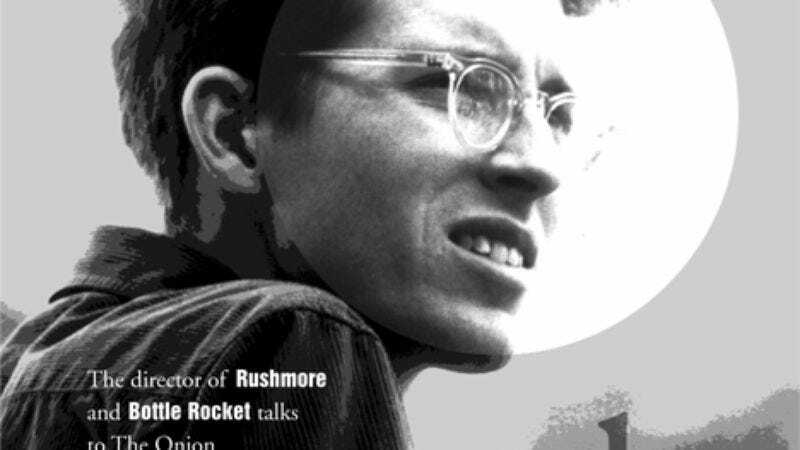 O: Why is Rushmore finding an audience when Bottle Rocket didn't? WA: Well, with Rushmore, we'll see what audience it finds when it really opens. But certainly it's gotten a lot more attention at this point. With Bottle Rocket, nobody had even heard of it right before it was released. It wasn't until two years later that people even knew about it. The main thing is that this one has a studio behind it. Joe Roth is the guy who runs Disney, and he's the one who invited us to make the movie there. Sony, on the other hand, was not really interested in doing [Bottle Rocket]. And it was the producers, James L. Brooks and Polly Platt, who invited us to do it there. It was a very different kind of arrangement. With this one, we're getting opportunities to show the movie to more people and talk to more people about it, and they're promoting awareness in a way we didn't have with Bottle Rocket. O: It seems like one of the great problems of making movies in this decade is that it's nearly impossible to get one properly released. WA: In the '70s, you could just open it small and it could slowly build, and it would stay around for a long time. And that was a way that a movie that might be considered a total art movie today might find its way into the mainstream, because it would be given time to develop. And now, it's impossible. It doesn't work that way any more. You can't force it that way, even. It won't last. WA: Video definitely provides that. The sad thing is that watching a movie on video is not the same. And also, when something is discovered by people in movie theaters, it's discovered by people who are all together, and there's a sort of feeling of an event about it. And when it's on video, it's like something is being discovered in the library or something. It's like having a second life in public libraries. It's just like individuals, and it's less of a… We can't participate in it the same way. O: The films that you and Owen Wilson write seem to be short on characters without redeeming facets. The only characters I can think of that are thoroughly unlikable are Bill Murray's kids in Rushmore. Is there a reason why? Are you just nice guys? WA: [Laughs.] I'm attracted to movies like that, where there aren't lots of bad guys. There's some quote by Jean Renoir about that, and I've always loved his movies: He said that everyone has his reasons, and once you know their reasons, people become sympathetic. The two kids, though, are not very sympathetic. I actually like them, though—in real life, I mean, the two guys who play the brothers [Ronnie and Keith McCawley]. They're very similar to the characters they're playing, so maybe we didn't do a great job. Because they're very similar to who they're playing, but the more you get to know them, you start to like… I definitely kind of miss them. WA: Right. That's right. We just didn't give them any time. WA: Well, it's the same thing with the people who are on my crew; my department heads are all people from Bottle Rocket, and it's the same thing with a number of the actors. The advantages are that it's people you know how to work with. You know they fit in with the group. And also, if you're friends with people, it's nice to work with them. I brought back people who are people I love to see in movies anyway. They're actors that I love. And now I have a whole bunch of new ones from Rushmore who I would like to work with again, because we became friends. O: And you're probably working with Bill Murray again on your next film. How far along are you with that? WA: Well, we're just working on the script, so we have a lot of work to do. O: We were talking the other day around the office about different films that influenced us at an early age—say, as a kid or a teenager. Can you name some of yours? WA: Watching them, and also there was an awareness of Steven Spielberg, this guy who made them and had all these ideas and things, you know? And when you're aware of the guy who made it, that's suddenly part of the equation. Instead of just, "I want to be Indiana Jones," there's this other guy making it. O: Does it bother you to be potentially pegged as the head of a new movement? I know there's a Film Comment article that mentions you as part of something called "the new sincerity." Do you pay attention to any of that? WA: Well, I don't know. Who else is in "the new sincerity"? O: I don't know. I think it's just you at this point, and they're waiting for people to line up behind you. WA: Oh, well, I'm not waiting for that line to form, and I don't expect it to. I don't know if there's ever going to be much of a movement in that direction. It sounds like one that could be boring for a lot of people. WA: I don't know. That's probably just some glib answer. Movement? I would be into a movement. But I'm really not aware of any movement. O: So you don't plan to draft a Dogme '95-style statement. O: You've always been interested in creating stuff. What's the earliest creative effort you can recall? WA: I did all these plays. The earliest thing… Huh… I made a little book of drawings of houses that I worked on for a long time. It was sort of like dream houses. It was an extended project, a sustaining project that went on for a long time. That was the first thing I can remember being something I worked on—not just drawing some pictures, but working on it every day—for a long time. It was just like a series of pictures of mansions that I wanted to own. WA: There are a million choices, and they have to do with the design of the rooms you're setting it in, and the clothes the people wear, and then the music, and which cars you use. And also just the way the characters are, the way they talk. WA: I do it because the nature of the stories is that they're not topical or timely, and I don't want them to be. I want them to be the kind of stories you can go back to and they won't feel dated. It's also just what I'm drawn to. I don't want to have current, contemporary references in it. I want it to be something that's sort of self-contained. O: One thing I've always wondered about is how the current trend of incorporating tons of pop-culture references will hold up 30 years from now. WA: It's interesting: In 50 years, those references will be interesting because people will have no idea what they're talking about. But in 10 years, they're going to be passe. It's going to be put in its time no matter what. Just because there it is. You're seeing all kinds of things that reflect the time it was made, and it shows the sensibility of when it was made. But I think the more you keep things in their own little world… I don't like to violate that world. I like to make it so it has its own sort of little logic.